Ken Ebo is currently the trombone instructor at The School of Music located on Little Creek Joint Expeditionary Base in Virginia Beach where he teaches all new trombonists for the U.S. Navy and U.S. Marine Corps band programs. He received his undergraduate degree from Indiana University where he was a student of M. Dee Stewart, David Baker, and Dominic Spera. After several years teaching and performing on the road, Ken completed his Master's degree at the University of South Carolina studying with Dr. Brad Edwards and Bill Zehfuss. He has 25 years of professional performing and teaching experience, both civilian and military. 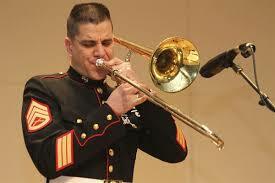 Ken is a recipient of the Musician of the Year Award for the US Marine Corps and has played lead trombone for the USMC All-Star Jazz Ensemble since 2009. An active clinician and performer, he also directs a series of benefit jazz concerts for Toys for Tots in Baltimore and Virginia Beach. Ken lives with his wife and two children in Virginia Beach where he makes it a practice to not practice in order to hear his kids practice trumpet, violin, and piano.